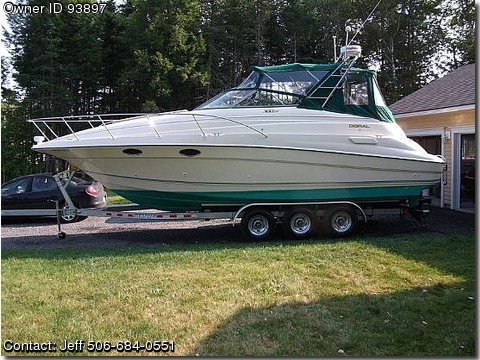 Call Boat Owner Jeff 506-684-0551 506-684-5664. Description: 1996 Doral 300SE for sale and in excellent condition. 2 5.7 litre Merc's with Alpha 1 Gen 2 drives. Windlass, 2 fridges, 2 burner stove, microwave 2-CD players 1 new 2012, Bimini top, mooring cover new in 2012, snap out cartet, Coast Guard pack, compass, dockside power, full gauges, head, hydraulic steering, radar, rod holders, 2 showers, SS prop., storage, swim platform, trim tabs, VHF, H&C water, sleeps 6, and more. Selling with the tripple axle trailer which is a 2009. Boat is now in storage but can be seen at any time.